Description: This Spring seasonal beer, originally launched as a draught-only product, is now available in bottles for limited edition release. Consistent with the Bavarian-style of “March” beer, this beer is a darker, heavier take on the traditional lager, employing what I can only assume are Vienna Malt and Zaltec Hops to create a malty, dryly hopped amber lager. 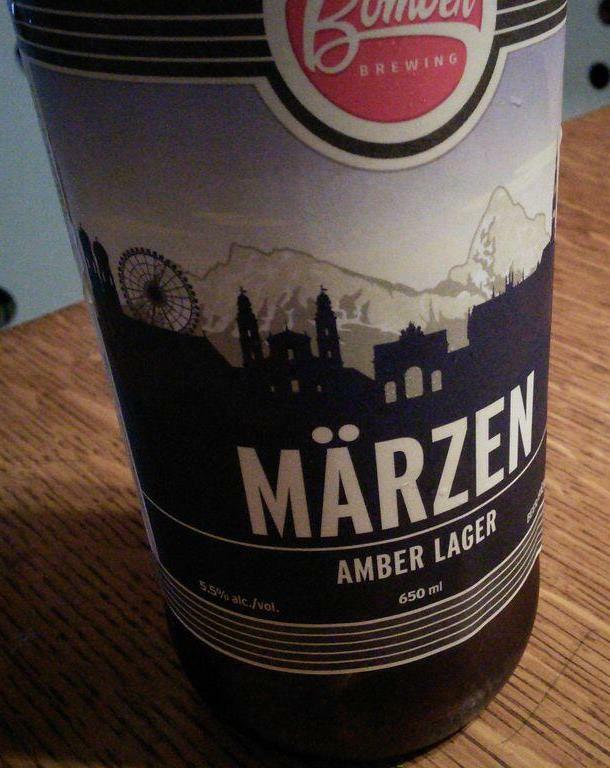 Tasting Notes: I’ve been a fan of Marzen’s for quite some time, due to the fact that they are both clean drinking and refreshing as well as rich and malty. Bomber’s take on this was certainly faithful. In addition to the clean drinking quality of a lager, it had rich malts, a slightly sweet taste, viscous mouthfeel, and a nice, dry hop finish. Not a bad intro to this brewery either! Description: Brewed in honor of Parallel 49’s second anniversary, this combination brew is fashioned using Pilsner malt and German Magnum and Mittelfrueh hops. It is then fortified with cane sugar and fermented with a combination of brettanomyces and other yeast cultures. Tasting Notes: As always, P49 is at the forefront of experimentation, merging different styles in order to create new and interesting beers. In this case, we get a beer that embraces elements of a sour ale (the brettanomyces that triggers the accumulation of lactic acid), Pilsner and Noble hops for a lager-like crispness and clean flavor, and cane sugar that lends its a Belgian Strong blonde ale flavor. This combination leads to a certain apple cider-like taste crossed with a Belgian Triple. Description: La Folie, French for ‘the folly’, is part of New Belgium’s Sour series, which celebrates a distinctive Belgian brewing tradition. Using wild, naturally occurring yeasts, this brown ale develops a natural sour flavor loaded with lactic acid. The ale is then aged in oak barrels for one to three years before being bottled. Tasting Notes: As Oud Bruines go, this beer was exceptionally dry and tart. And consistent with this style, it smacked of tartness and sour flavor, and had some serious fruit esters. These called to mind green apples, sour cherries, apricots; and of course, plenty of oak tannins. Description: This is the third beer in the Hulks Series named for the decommissioned vessels that make up the floating breakwater in Powell River. Brewed in the Abbey ale-style, the Cardena is a quadruple. And consistent with this style, it employs a strong malt base with a high alcohol content. Tasting Notes: It’s always a delight to try one of Townsite’s specialty brews. Without exception, they’ve done great things with their Hulk Series and this one was no exception. In addition to being deliciously malty, dark, fruity and sugary, it’s got a well balanced flavor due to just enough citrus hop bitterness. It’s a lot like a barley wine, but except with the infusion of the telltale Belgian yeasts that give it an added distinctive flavor. Like Kerstmis in the glass! Description: An Abbey-style Amber ale, this beer is made form a combination of malts (what I assume are Caramel, Pale and Amber) that lend it a sweet, syrupy and viscous flavor. It is then double fermented for added strength and bottle conditioned for a highly smooth flavor. Tasting Notes: I first learned of Grimbergen when in Paris, and enjoyed their Blonde Ale quite a bit. So I pleasantly surprised to learn that not only did they stock this brewery’s products here in BC, but that they also had more of their regular lineup. The double ambree is a good example of an Abbey-style amber, boasted smooth, sweet caramel malts, a yeasty backbone and subtle hops flavor. It then rounds all this out with a chewy mouth feel. Description: As a Benefit Brew, the Surfrider Pilsner is brewed in support of the Surfrider Vancouver Island Foundation. The brewery donates 25¢ from the sale of each bottle to aid in their earth-conscious initiatives. The beer is fashioned from a combination of what appears to be Munich and Vienna malts and flavored using Saaz hops. Tasting Notes: As Bohemian lagers go, this beer is a pretty faithful example and is quite a refreshing summer brew. True to form, it has a grainy flavor that is slightly sweet and crisp, has a bitter finish, and is all around well-balanced and clean. Description: As part of their Brewmaster Series, this Czech Pilsner is available year round and now comes in both 650ml bottles and six packs. In the tradition of Bohemian-style lagers, this beer is fashioned using Vienna and Munich malts, and then bittered with Noble Saaz hops. Tasting Notes: It took me some time to review this beer, and I’m rather sorry I didn’t try it sooner. True to its roots, the beer is both crisp and slightly sweet, owning to the combination of Vienna and Munich malt, which also impart a slight, grainy texture to it. The addition of Saaz hops provides a slight bitterness which rounds this out nicely, leading to an all-around flavorful, but clean and refreshing, drinking experience.